Yey! Its finally time to work with the floppy drive! This chapter covers almost everything there is to know about the floppy drive and programming the floppy disk! 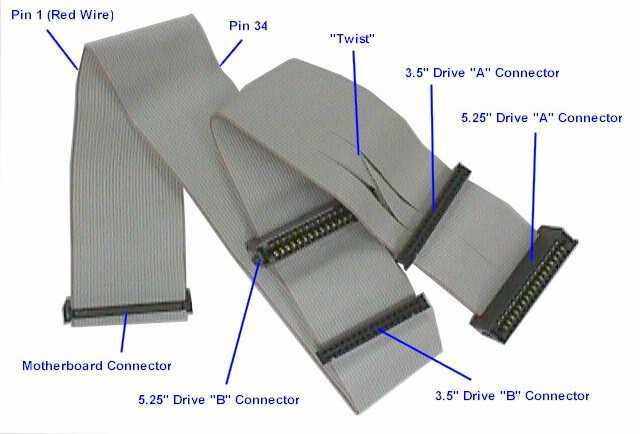 The Floppy Disk Controller (FDC) is the controller that interfaces with the Floppy Disk Drive (FDD). The PC useually uses a form of the NEC ?PD765 FDC. PS/2 useally uses a form of the Intel 82077A while the AT useally uses a form of the Intel 82072A microcontroller. The Floppy disk drive (FDD) is a device that is capable of reading and writing data to a floppy disk. In 1971, David L. Noble, hired by Alan Shugart, who was the IBM Direct Access Storage Product Manager, tried to develop a new storage tape format for their System/370 mainframes. IBM was looking to create something that is smaller and faster then tape drives when reloading the microcode for their Initial Control Program Load (ICPL). Nobles team worked on a product under the code name "Minnow" called a "memory disk". It was a read only, 8 inch diskette, having the capacity of 80 kilobytes. It was commercially released in 1971 and shipped with all System/370 mainframes. When Alan Shugart left IBM and moved to Memorex, his team shipped the Memorex 650 in 1972, the first read/write floppy disk drive. Floppy disks were invented by IBM in 8 inch, 5 and 1/4 inch and 3 1/2 inch formats. This is the physical layout of a generic 3-1/2" floppy disk. Here, we are looking at Head 1 (The front side), and the Sector represents 512 bytes. A Track is a collection of sectors. Note: Remember that 1 sector is 512 bytes, and there are 18 sectors per track on floppy disks. Each Track is useually divided into 512 byte sectors. On floppies, there are 18 sectors per track. There is 2880 Sectors total. To better understand everything, we should have a look at CHS. Lets take a look at that next! A "Sector" simply represents a goupe of 512 bytes. So, Sector 1 represents the first 512 bytes of a disk. A track is one ring around the disk. In the case of floppy disks, 18 sectors span a single track. The Cylinder number represents a track number on a single disk. In the case of a floppy disk, It represents the Track to read from. There is 18 sectors per track. 80 tracks per side. The floppy disk addresses using CHS format. In order to read or write from any location on disk, we must tell the FDC to move the Read/Write Head to the exact track, cylinder, and sector on the disk to read or write to. We can also provide a more abstract way of reading and writing to disks using Linear Block Addressing (LBA) instead. LBA allows us to be able to read or write to any sector on disk from sector 0-2880. Software interfaces with the floppy disk drive by controlling it through a floppy disk controller. Do to differences in floppy disk controllers, I would like to focus on the original 8272A Floppy Disk Controller. The image at the beginning of this chapter shows a typical 8272A Integrated Circuit (IC) controller. This is the IC that we will look at here. 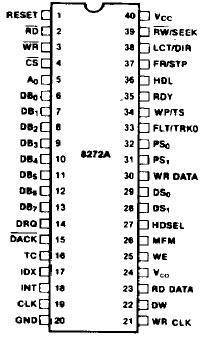 The 8272A IC has 40 pins. Lets take a look at it here. While we will take a brief look at all 40 pins, we will not look at it in full detail here as that is when we cross into the electronics field. Most of these pins are not very useful for programming the controller. Other pins are more important to understand, however. Lets take a look. For completness sake, we will look at all of the pins brefily. You will see that the FDC indirectly communicates with both the Programmable Interrupt Controller (PIC), the system bus, as well as the Direct Memory Access controller. RESET Pin - places the FDC in an idle state. It drives all output lines low. The Vcc pin is a +5 V power input. GND Pin - is the ground pin. CLK Pin - typical Single Phase 8 MHz Squarewave clock signal. RD Pin - tells the FDC that the current operating is a read operation. WR Pin - is simular, but for a write operation. These are set by the Control Bus in an I/O read/write operation by software. DB0 - DB7 Pins - bidirectional 8 bit data bus. It connects indirectly to the systems primary Data Bus. A0 Pin - Data/Status Register Select pin. If it is high (1), it tells the FDC to place the contents in its Data Register to the data bus. If the line is low (0), it copies the contents of the Status Register to the data bus. This is done through the output data bus pins DB0 - DB7, which in turn is through the systems data bus which can be read by software. DRQ Pin - Data Direct Memory Access (DMA) Request pin. If this line is high (1), the FDC is making a DMA request. DACK Pin - DMA Acknowledge pin. When the controller is performing a DMA transfer, this line will be low (0). TC Pin - When the DMA transfer is completed, the FDC sets the Terminal Count pin, TC to high (1). IDX Pin - high when the FDC is at the beginning of a disk track. INT Pin - is high (1) when the FDC sends an Interrupt Request (IR). This line is indirecty connected to the IR6 on the Programmable Interrupt Controller (PIC). RW/Seek Pin - Sets seek mode of read/write mode. 1: Seek mode, 0: Read/Write mode. LCT/DIR Pin - Low current/Direction pin. FR/STP Pin - Fault reset/Step pin. WP/TS Pin - Write protect/Two side pin. In Read/Write mode, set high if media is write protected. If seek mode, set high if media is two sided. FLT/TRK0 Pin - Fault/Track 0 pin. In Read/Write mode, set high on a detected FDD fault. PS0 - PS2 Pins - Precompensation (Pre-shift) pins. Write precompensation status during MFM mode. HDSEL Pin - Head Select Pin. When high (1), the FDC sets the FDD to access Head 1. When low, it is head 0. MFM Pin - When high, FDC is in MFM mode. If low (0), it operates in FM mode. WE Pin - Write enable pin. VCO Pin - VCO Sync pin. When 0, inhibits VCO in PLL. When 1, enables VCO. DW Pin - Data Window pin. Generated by PLL, used for sample data from the FDD. The FDC can operate with or without a Direct Memory Access (DMA) controller. If it is operating in a non DMA mode, it will generate IRQ 6 for every transfer of a data byte between the processor and the FDC. In DMA mode, the processor will load a command into the FDC and all data transfers will occur under control of the FDC and DMA controllers. This is important! You do not need to know all of the FDC pins. Rather, just remember that the FDC communicates with three primary controllers. The first is one of possibly four Floppy Disk Drives (FDD) internal controllers, the programmable interrupt controller (PIC), and the Direct Memory Access (DMA) controller. Software communicates with the FDC by the processors standard IN/OUT port i/o instructions. Several registers in the FDC are mapped into the processors i/o address space. As with standard I/O port reads, during an in and out operation, the processor sets the READ or WRITE line on the control bus, and the port address on the address bus. This is done on the system bus or the Industry Standard Architecture (ISA) bus. On newer hardware, the FDC is not directly connected to the ISA bus, but is rather integrated as a Super I/O IC and communicates with the processor through the Super I/O's Low Pin Count bus. Okay! We know how the software can communicate with the FDC. Where does the PIC and DMA come into play? Looking at the pin listing above, we can see that the FDC has a pin called INT. This line is indirectly connected to the Programmable Interrupt Controller IR 6 line. The FDC will pull this line high (1) whenever a byte of data is ready to be read or written. This also pulls the PIC IR 6 line high. From here, the PIC takes control. It masks out the other lines and determins if it can be services. It notifies the processor of an interrupt by activating the processors Interrupt Acknowledge (INTA) pin. After the processor verifies that it is safe to service the interrupt, it resets the INTA line to ackowledge the PIC to proceed. The PIC places the interrupt vector that this IRQ is mapped to use (set up during initializing the PIC). The processor takes the IRQ, gets its address from the idtr, and voila - our interrupt is called. The FDC can also be programmed to operate in DMA mode. The DMA is a controller that we have not looked at yet. Because of this, I do not want to get too involved with it. However we may go over it in the next chapter for completness. The FDC is connected to DMA channel 2. Thats all there is to it for the FDC hardware. Their can be multiple FDCs inside of a computer system. Each FDC can connect up to 4 Floppy Disk Drives (FDDs). This is important! Alot of times when communicating with a FDC, you have to select which FDD that the request is for. The FDC communicates with a FDD through a Floppy Interface Cable, which is a form of a Parallel ATA (PATA) cable also known as an Integrated Drive Electronics (IDE) cable which evolved from Western Digital. You should notice a twist in the above cable. That will be described a little shortley. This cable has 40 pins. Through these 40 pins, the FDC can talk to different FDD's that are connected to the cable. Some registers that are used to communicate with the FDC allow you to detect the input pins of the controller and the cable. Because of this, we should probably at least take a small glance at the 40 lines of the cable. 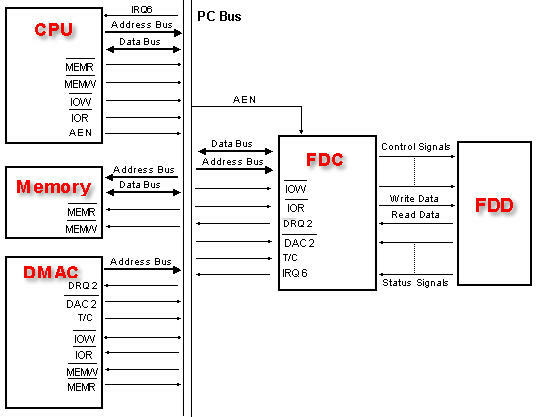 Most FDC's these days are more advanced then the original 8272 microcontroller. To acheive backward compatability, newer FDC's add additional pins to the controller and allow different registers to be communicated with when operating in a specific mode. For example, the Status Register A mode is only accesable when the controller is running in PC-AT mode. Upon controller reset, the controller operates in the default 82077A mode. Remember that the FDC uses IRQ 6? The FDC will send a byte after the completion of a read or write command, or, depending on its mode, for every byte transferred. It will also send an IRQ when the controller is reset during initialization. For our purposes, we will be operating the FDC in a DMA mode. Basically what this means is that we will only be getting an interrupt whenever a read, write, seek, or calibrate command completes as well as during initialization. In all cases, however, this means that we will need to wait for an IRQ to fire so we know the command completes. A way for us to do this is to have the IRQ set a global when it fires, and provide an irq_wait like function that waits for the IRQ, and resets the global when it fires. What? We are programming the FDC in DMA mode? But we have not covered the DMA yet! Yes, yes indeed this poses a problem. I was originally going to program the FDC in Non-DMA mode. However, while this might work in some cases, alot of emulators and even some hardware do not support it anymore. Because of this, to retain portability, I decided that the best bet is to stick with using the DMA (Direct Memory Access Controller [DMAC]). The demo uses 0x1000 + 64k for the buffer so you should keep it there if you dont feel confortable changing it. dma_read and dma_write just tells the DMA to start reading or writing the data that the FDC sends it. This will be the sector that we tell the FDC to read or write. For example, if we tell the FDC to read a sector, it will give the sector data to the DMA to be placed in the buffer that we set it to (which is at 0x1000). Cool, huh? If you dont understand the above code, dont worry. Everything reguarding the DMA will be rewritten and explained in the next tutorial when we cover the DMA in more detail. The FDC has four external registers that are mapped into the i86 I/O address space. These can be accessed by software through standard I/O instructions. I bolded these registers. Some systems may provide more external registers to their FDC's then the primary four. The second FDC is typically mapped to I/O ports 0x370 - 0x377. Because there are two sets of ports for two different FDC's, this table will include both port sets. We will take a look at the registers closer - bit by bit - in the next section. Well, the important ones anyways. I may decide to update this chapter covering the other registers for completness purposes, though. For now, we will only focus on the first four registers shown above. Remember that all of this code is in the demo at the end of this chapter. You do not need to know this register. It is here for completness only. This is a read only register that monitors the state of several interface pins on the controller. It is not accessable when the controller is in PC-AT Mode. This is a read only register. The exact format of this register may depend on the model of the controller. Warning: These bits can change between controller models. Do not worry if this register seems complex; it can be without experience in electronics. It is here for completeness only and will not be used in the series. Simular to the above register, this allows us to monitor the state of several lines of the FDC. It is not accessable when the FDC is in PC-AT Mode. This is a read only register. This is a write only register that allow you to change the timings of the drive control signals. It is used by writing to I/O port 0x3f4 (FDC 0) or 0x374 (FDC 1). DRATE SEL0 - DERATE SEL 1 are used to set the data rate. Valid values are shown below. Warning: Setting Data Rates greater then drive can handle may cause errors. Yey! The first useful register! This one is important to know. This is an easy one! Basically when sending a command to control the functionality of the FDC, just build up a bit pattern to select what drive this is for (Remember that a single FDC can communicate with four FDD's! ), the controller reset status, mode of operation (Remeber that the FDC can operate in both DMA and IRQ modes?) and the status of that particular FDD internal motor. Here is an example. Lets say we want to start up the motor for the first floppy drive (FDD 0). Starting the motor for the FDD is needed before performing any read or write operations to it! To start it, just set the bit (4-7) that corrosponds to the drive you want to start or stop the motor. Keeping all other bits at 0 will be a normal operation (IRQ mode, reset controller.) Knowing that the DOR is mapped to the processors i/o address space at port 0x3f2, this becomes very simple. First, we will create bit masks for the register to increase readability. Rememeber that all of this code is also in the demo at the end of this tutorial. Remember that FLPYDSK_DOR was defined ealier as 0x3f2, which is the i/o address of the DOR FDC register. The above also resets the controller. Warning: Give the motor some time to start up! Remember that the internal FDD motor is mechanical. Like all mechanical devices, they tend to be slower then the speed of the running software. Because of this, whenever starting up a FDD motor, always give it a little time to spin up before attempting to read or write to it. Lets move on to the next important register! This MSR is a simple one. It containes the current status information for the FDC and disk drives. Before sending a command or reading from the FDD, we will need to always check the current status of the FDC to insure it is ready. Here is an example of reading from this MSR to see if its busy. We first define the bit masks that will be used in the code. Notice how it follows the format shown above. When sending a read or write command, all we need to do is wait until this bit is 0. Cool, huh? To make readability easier, I decided to hide this in a routine so here it is. This routine just returns the status of the FDC. This register allows us to assign tape drive support to a specific drive during initialization of that drive. This is a read/write register and is 8 bits in size. However only the first two bits are defined. They both are used to select between drive 0 - 3. Selecting Drive 0 is not allowed as that is reserved for the floppy boot device. Because of this, it is not in the bit list shown below. This is a 8 or 16 bit read/write register. The actual size of the register is specific on the type of controller. All command paramaters and disk data transfers are read to and written from the data register. This register does not follow a specific bit format and is used for generic data. It is accessed through I/O port 0x3f5 (FDC 0) or 0x375 (FDC 1). Note: Before reading or writing this register, you should always insure it is valid by first reading its status in the Master Status Register (MSR). Remember: All command bytes and command paramaters are sent to the FDC through this register! You will see examples of this in the command section below, so dont worry to much about it yet. If an invalid command was issued, the value returned from the data register is 0x80. The following routines read from this register and are use in the demo. It attemps to wait until the data register is safe to read or write to, then it either reads it (read_data function) or write it (send_command function). Okay, there was a digital output register (DOR) so I am sure you seen this one coming :) This is a read only register in all operation modes of the controller. Only bit 7 is defined when running in PC-AT Mode, all other bits are undefined and should not be used. In other operation modes, Bit 7 is undefined. Bit 7 (DSK CHG) monitors the DSK CHG pin of the FDC. Looking at our pin layout at the beginning of this chapter, you will see that there is no DSK CHG pin. This has to do with the differences between the newer FDC models and the original model. Newer models added and changed different bits in this register to monitor newer pins on the FDC, such as DMA GATE, DRATE SEL0/1, etc. The values of this register is specific to the operation mode of the FDC. Note that the bits in this register can change between models. Bit 2 is NOPREC in Model 30/CCR modes and has no function. Other bits are undefined and may change depending on controller. Like the other registers, I created a routine so we can write to this register. Warning: Before sending a command or paramamter byte, insure the data register is ready to recieve data by testing bit 7 of the Main Status Register (MSR) first. Commands will only operate on a single head of the track. If you want to operate on both heads, you need to set the Multiple Track Bit. Alot of these commands follow bit formats (Will be shown below). This is where things get complicated. A command byte only uses the low 4 bits of the byte for the actual command (can be more.) The high bits of these command bytes are for optional settings for the command. I call these extended command bits but it does not have an official name. There is a couple of these bits that are common for alot of the commands that we will need to use. We will look at these bits in the command byte later. Okay, first lets take a look the command listing. We will then look at each one separately. Notice how they all only use the first 4 bits of the command byte. Some of these commands require you to pass several bytes before the command is executed. Others return several bytes. To make things easier to read, I have listed all of the commands, formats, and paramater bytes in tables. Each command comes with an explination and an example routine. Okay, now remember when we mentioned exteneded command bits and how the commands above are only four bits? The upper four bits can be used for different things and purposes. When describing the format of a command, we represent an extended bit with a character (like M or F.) For example, the Write Sector command has the format M F 0 0 0 1 1 0, where the first four bits (0 1 1 0) are the command byte and the top four bits, M F 0 0 represent different settings. M is set for multitrack, F to select what density mode to operate in for the command. The M, F, and S bits are very common to alot of the commands, so I decided to stick them in a nice enumeration. To set them, just bitwise OR these settings with the command that you would like to use. GAP 3 referrs to the space between sectors on the physical disk. It is a type of GPL (Gap Length). 2^n * 128, where ^ denotes "to the power of"
n is a number from 0-7. It cannot go higher then 7, as 2^7 * 128 = 16384 (16 kbytes). It is possible to select up to 16 Kbytes per sector on the FDC. Most drives may not support it, however. ...So, if a command requires us to pass the number of bytes per sector, dont put 512! rather, put FLPYDSK_SECTOR_DTL_512, which is 2. Unlike functions in programming in which you can ignore return values, the FDC requires for them to be processed in some way. Granted, you can still ignore them, but you must get them from the FDC. The FDC wont allow any more commands until it is done. If the command returns data, it will be returned -- one at a time -- in the FIFO (Data register). So, to read them, you must continually read the FIFO to get all of the returned data. Note: If a command returns data, it will send an interrupt that you must wait for. This is how you will know when the command is done and that it is safe to read the return values from the FIFO. Of course, for error checking purposes you should actually check some of the return values. This command reads a sector from a FDD. For every byte in the sector, the FDC issues interrupt 6 and places the byte read from the disk into the data register so that we can read it in. Afterwords, it passes all of the commands paramaters to it to begin the read command. The sector size paramater is FLPYDSK_SECTOR_DTL_512 (bytes per sector), which, if you recall, is the value 2 (Please see the above Bytes per sector section for details.) Next paramater is the sectors per track (18). The next paramater is the GAP 3 length. We pass the value of the standard 3-1/2" floppy disk GAP 3 length (FLPYDSK_GAP3_LENGTH_3_5, which is 27). The Data Length paramater byte is only valid if the sector size is 0. Else, it should be 0xff. Because this command sends an IRQ after completion, we need to wait for the IRQ. Wait... Where is the data at? Looking at the above command, we dont tell the FDC will to put the data at. This poses an interesting problem, dont you think? So, in our case, we set up the DMA buffer to 0x1000, remember? After calling the above routine, the sector data will be at 0x1000! Cool, huh? We can change its location by giving the DMA a different address. This command returns the drive status. If, after the command, we are not on cylinder 0 yet, we issue the command again. When we find cylinder 0, we turn the motor off and return success. If we dont fine it after 10 tries we bail. Note that we have to insure that the motor is running during this command. Also notice how we use the SENSE_INTERRUPT command (the flpydsk_check_int () call) to abtain the current cylinder. 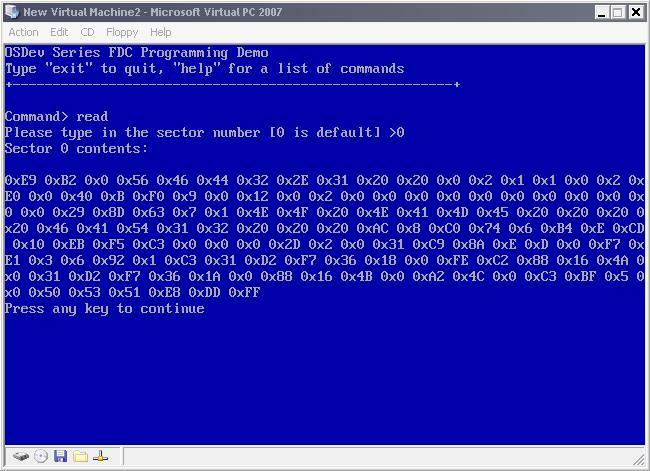 This command is used to check information on the state of the FDC when an interrupt returnes. This command is used to move the read/write head to a specific cylinder. Simular to the calibrate command, we may need to send the command multiple times. Notice the call to check_int () to get the current cylinder after every attempt. We then test if the current cylinder is the cylinder we are looking for. If it is not, we try again. If it is, we return success. If an invalid command is sent to the FDC, the FDC ignores it and goes into standy mode. When the controller is enabled after being disabled, it will issue an interrupt. During this time, you must reinitialize the controller and drive configuation. Afterwords its time to reconfigure the controller. Remember that the CCR (Configuation Control Register) only has 2 bits for the data rate. By setting both to 0, we set the data rate to 500 Kbps, which is a nice default value. Then we call flpydsk_drive_data which sends a Fix Drive Data / Specify command to the controller to set the drives mechanical information, including: Step rate, head load and unload time, and if it supports DMA mode or not. Then we recalibrate the drive so it is on cylinder 0. After a reset, the drive is ready to be used by us. Demo Download Note: There is a known bug in the demo that causes VPC to only read the first sector read. This will be resolved as soon as possible. No known issues when running in Bochs. In order to make this demo more interactive, I included three functions in the standard library that are used for converting strings into integers. This includes strtol, strtoul and atoi. The demo uses atoi to convert a string entered from the user into a useable integer. The floppy driver comes with a nice install routine that allows the demo to easily set it up. All it does is install our interrupt handler using our HAL's setvect () routine, initializes the DMA for transfers, and resets the controller so it is ready for use. The demo calls this function during initialization to set up the driver before attempting to read from it. The driver hides the details of CHS behind two nice functions. Knowing that the drive works in CHS (Cylinder/Head/Sector) and does not know anything about LBA (Linear Block Addressing), we should provide a routine to convert between these two. This way we can just pass in a sector number to read or write to/from without worry of what physical CHS it is at. FLPY_SECTORS_PER_TRACK is 80. Great! So now we can just call this function to convert any linear sector number into a CHS location! Cool, huh? Because we are wanting to be able to read any sector from disk, we can provide a routine for just that. And because we already have flpydsk_read_sector_imp, which containes the code to send the read command to the controller, this routine is very simple. Whenever the demo wants to read a sector, it calls this routine. This routine converts the sector into a physical location on disk (CHS). It turns the motor on and seeks to the cylinder that this sector is on. After words, it calls flpydsk_read_sector_imp to perform the magic of actually reading the sector and turns the motor off afterwords. After the flpydsk_read_sector_imp call, the data for the sector should be in the DMA buffer. We return a pointer to this buffer, which now containes the sector data just read. Cool, huh? This demo builds on the last demo. Because of this, it keeps the command line interface (CLI) that was built in the previous demo. This also makes this demo the most complex demo yet. I have added a new command to our list of commands in the CLI - read - that allows us to read any sector off disk. It uses out floppy driver built in this tutorial to do it. In the next tutorial, we will be looking at the DMA. We will create an interface for programming the DMA and better use it in the FDC driver. After all of this...I suppose its filesystems again (ugh). Dont worry - After that it is Multitasking!